A version number bump and nothing else is dishonest, it's just used to increase a software's ranking. As I said above, if there is an actual change - fine. But if you read above my last comment you will note that the author was just changing the version number and nothing else. If we could exclude apps from the RSS read, I'd do that - but I get sick of seeing the same program day after day after day listed in the feed. Chris: a filter is in place to avoid too many updates, but its up to the author how they want to release their software. Daily releases are common in some circles and don't imply the updates aren't worthwhile. That's two days in a row the RSS shows updates for this program - please don't start the 'daily updates with no actual changes' thing again. If it actually has some changes, fine - but the author has shown he will update the version number and nothing else just to get it bumped up on this site. Again, I didn't see any changelog. Anyone know what has been fixed or improved in this version? I want to use it as an lightweight replacement of `hidesearch' extension of Emacs, but lacking of select/copy keeps me away. Nice app. I just wish you could edit, or at least copy and paste. I reduced the db version number to 1.1 (according version history). Curious - if it is only a version number change, why is the database still updated each day with a new version number (the RSS has shown a daily update for this program for the last week)? Thanks, but this is really boring. This is the uselessed update of the whole db. Nothing changed ... except the version number. You are running behind... version 1.1.0.509 released February 12. Guess what? Version 1.1.0.501 released (10 Feb.). Again just version # change. MuseTips does not respond to enquiries re. his frequent version # updates and does not provide change log. Please only update this database entry only when an actual update to the software is evident. The last 3 updates; when compared in a Hex Editor, show version # and date changes only. Has anyone a further comment about the version number ? it seem a bit funny to me... harmless, though I guess ?! What is changed ... except the version number? i like this... not sure how much i'll use it though. But it's like voidtool's everything for text files lol. 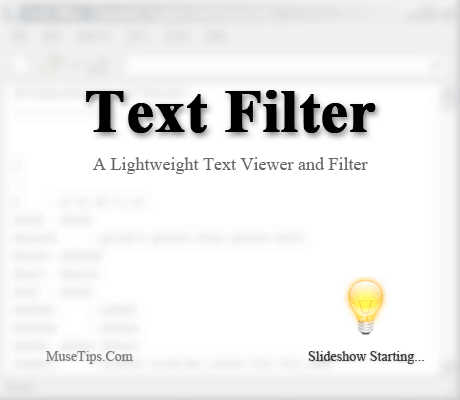 @MuseTips, Thanks for Text Filter, I've updated the entry for Unicode support. The author is currently, for some reason, just CONSTANTLY incrementing the version number (multiple times a day) with no actual changes to the code. If you compare different versions of the executable with an hex editor, you will notice only a few bytes are changing, those of the version and date. Look forward this funtionnlity in the next release. Keep up the good work MuseTips ! It actually supports unicode now in the new version at least since version 1.1 Nov 6, 2010.